Pokémon Go is a free-to-play location-based augmented reality mobile game developed by Niantic and published by The Pokémon Company. It was released in July 2016 for iOS and Android devices.The time has finally come for you to venture beyond the regions of Kanto, Johto, Sinnoh and more to catch ’em all. The long-anticipated Pokémon Go — an augmented reality mobile edition of the popular Nintendo franchise — has finally launched into app stores for both iOS and Android users. The first Pokemon games, Pokemon Blue and Red, were released in Japan in 1996, and have since spawned a lucrative franchise with cartoons, trading cards, merchandise and even themed cafes. Pokemon Go is the first official Pokemon game on the smartphone platform. With Pokémon GO, you can travel between the real world and the virtual world of Pokémon with Pokémon GO for iPhone and Android devices. The game allows players to capture, battle, and train virtual creatures, called Pokémon, who appear on device screens as though in the real world. It makes use of GPS and the camera of compatible devices. The game is free-to-play, although it supports in-app purchases of additional gameplay items. An optional companion Bluetooth wearable device is planned for future release, the Pokémon Go Plus, and will alert users when Pokémon are nearby. 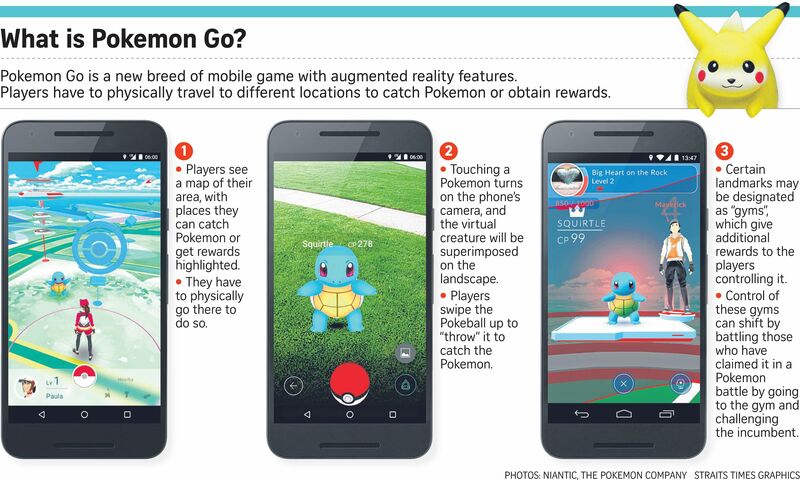 it’s not available for us trainers in Singapore just yet. For now, catching wild Pikachus in the tall grasslands of Punggol is a pipe dream as Pokémon Go is only available in the US, Australia and New Zealand. No solid launch dates have been scheduled for the rest of the world, but considering that we’ve been waiting since its initial announcement last year, we can probably wait a little while more. Or not. If you can’t wait to head to the Great Outdoors to make virtual creatures fight each other until they faint, there’s a way. We’re not saying the steps below are completely safe, though — you can try them out at your own risk of getting data corrupted. Like when you tried to catch MissingNo. You’re gonna have to create a new throwaway Apple ID though. Select ‘None’ in the Billing menu, add a random US, New Zealand or Australian address. Install Pokémon Go. When the app officially releases, go back to using your main Apple ID to download and reinstall it — your data’s saved to the cloud so you can pick up where you last left off.